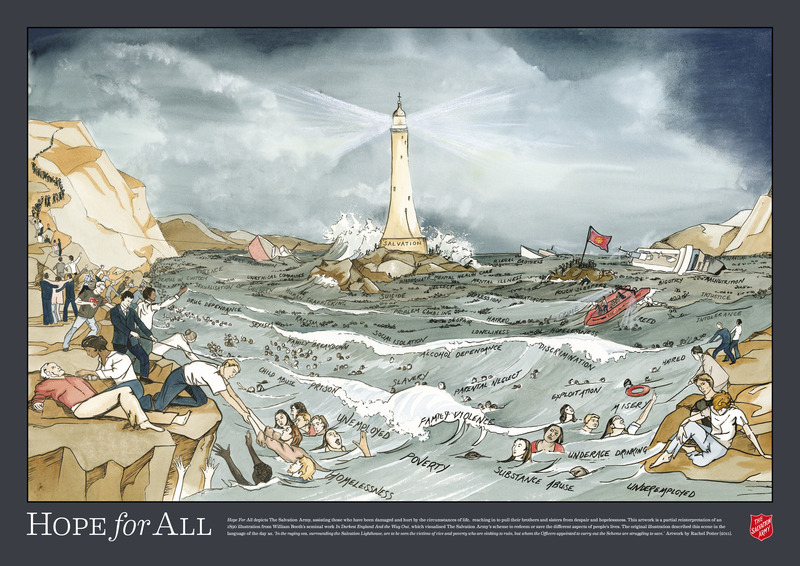 Hope For All (above) is a contemporary interpretation of an 1890 illustration depicting The Salvation Army assisting those who have been damaged and hurt by the circumstances of life. In the contemporary artwork people are pictured symbolically struggling with life issues such as loneliness, discrimination, racism, greed and hopelessness, and specifi c health and social issues such as addiction, malnutrition, family violence, financial crises and mental illness. Salvation Army officers, staff and volunteers are pictured reaching into life’s ‘turbulent waters’ to pull their brothers and sisters from despair and isolation. This artwork is a partial reinterpretation of a portion of an illustration (right) from The Salvation Army’s seminal work In Darkest England And the Way Out, co-authored in 1890 by Catherine and William Booth and W. T. Stead, which visualised The Salvation Army’s scheme to ‘redeem’ or save the diff erent aspects of people’s lives. 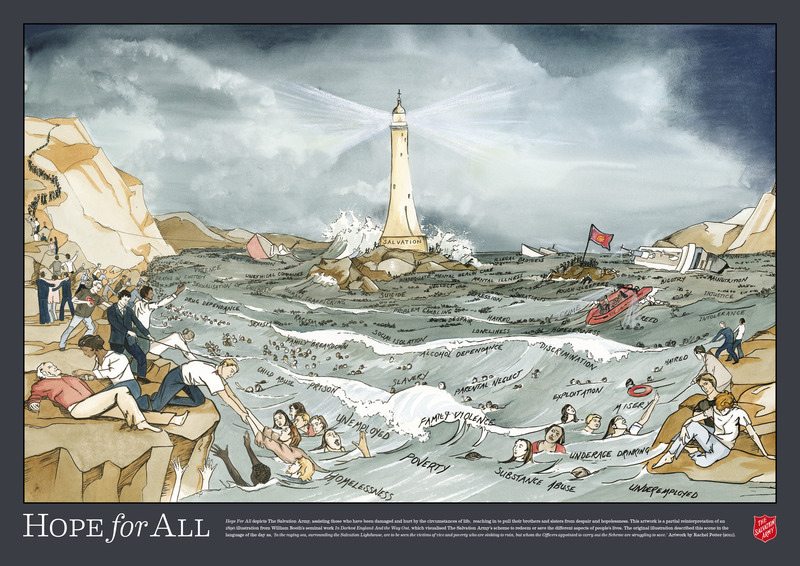 The 1890 illustration was described as follows, in the language of the day: ‘In the raging sea, surrounding the Salvation Lighthouse, are to be seen the victims of vice and poverty who are sinking to ruin, but whom the Officers appointed to carry out the Scheme are struggling to save.’ Contemporary artwork by Rachel Potter. The 'Hope for All' Poster is available to download below in three sizes; A1, A2 and A4 in both JPEG and PDF formats. Two versions of the PDF formats have been made available. "With Crop Marks" for professional printing purposes or "Without Crops" for printing on standard office printers.